I enjoyed being interviewed earlier this month by Hilda Labrada Gore for the Weston A. Price Association’s podcast series. You may listen to the podcast, which she decided to call The Motherhood Diet, for free on the Weston A. Price Foundation’s website, Libsyn or iTunes. Sally Fallon Morell’s story – how she had poor eyesight and crooked teeth but nourished herself well and reversed the trend and showed that such concerns are not genetic. None of her children needed orthodontics or glasses. how critical it is to avoid commercial fried foods, sugar, white flour, caffeine, drugs, alcohol, cigarettes, soy imitation foods, etc. 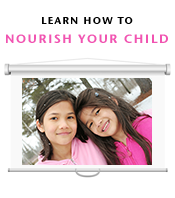 Nourished Children – private, closed Facebook group with peer-to-peer support that you are invited to join! Sandrine, you were a joy to speak with! You are so knowledgeable and you made it SO clear what young moms (or moms-to-be) need to eat to give their kids the healthiest start. I am certain your community will enjoy this show as a resource and will share it with those who need it most. Thank you so very much, Hilda! I look forward to the next one! Amazing information Sandrine, can you please give me the link/source to recommended liver capsules. I am having a hard time incorporating liver into my diet, and am pregnant. Thanks!